Lincoln City striker Bradley Barraclough has left the club by mutual consent and moved to Blue Square Bet North side Gainsborough Trinity. Barraclough, 23, has already spent a loan spell at The Northolme this season, and the Blues attempted to make the deal permanent in January. The approach was turned down and he now joins Trinity for free. "It made sense for me to move at this time of my career," Barraclough told BBC Lincolnshire. 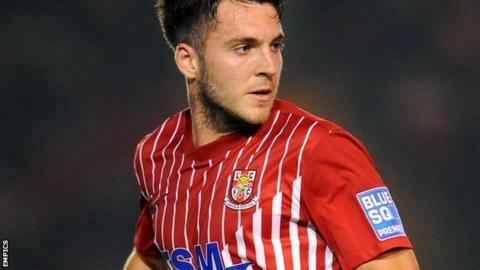 "I was on loan here at the start of the season and found my opportunities limited at Lincoln. "I want to be playing regular first team football and now I've ended up back with Trinity where I'm happy. "Hopefully, now that I'm here permanently I will get into a groove and play to my full potential because I feel that I've got a lot to give." Barraclough is available to play for the Blues in the FA Trophy semi-final clash at Wrexham on Saturday.